From left: Wright State police Sgt. Patrick Ammon, Capt. David Ratliff and Sgt. Richard Coy. Wright State’s police Sgts. 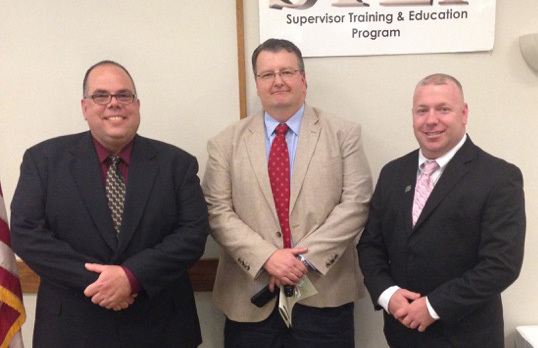 Patrick Ammon and Richard Coy completed the Supervisor Training and Educational Program (STEP) preparing them to be better equipped to protect the Wright State community. The STEP program helps newly promoted officers transition from a peer-relationship patrol officer to a manager. It offers 18 modules teaching civic leadership and communication to lead teams and respond to crises using the Critical Incident Management structure. Over the course of three weeks, officers are taught how to create an ethical environment, respond to domestic violence calls, respond to shooting and patrol operations, effective writing and other skills. The program is for Ohio law enforcement officers only. There are 260 STEP-trained officers in Ohio. All four of the Wright State sergeants have completed the program as a requirement set forth by Wright State Chief of Police David Finnie. Ammon has served the Wright State community for 12 years of his 17-year career in law enforcement. He serves as the Dayton and Lake Campus supervisor and crime prevention manager. What sets Coy apart is that he is a sergeant dedicated to the community and to the Police Department, Finnie said. He has a special uniqueness that he brings to Mini U, where he enjoys interacting with children. Coy worked 15 years prior to coming to Wright State. He has served at Wright State for about 12 years. He said that he wished he had the opportunity to take the STEP classes eight years ago when he was first promoted to sergeant. “Of all the sergeants that have attended, I am confident that STEP has made them better leaders for the Police Department and the Raider community,” Finnie said. “A Police Department by itself is limited in what it can accomplish, but with the Police Department and community working together, the possibilities are endless with what they can accomplish,” said Ammon.